It’s fall – no question about that. The chill in the air has arrived. My mums are out in front of the house. I bought a large amount of pumpkins and gourds to display. It’s fall. 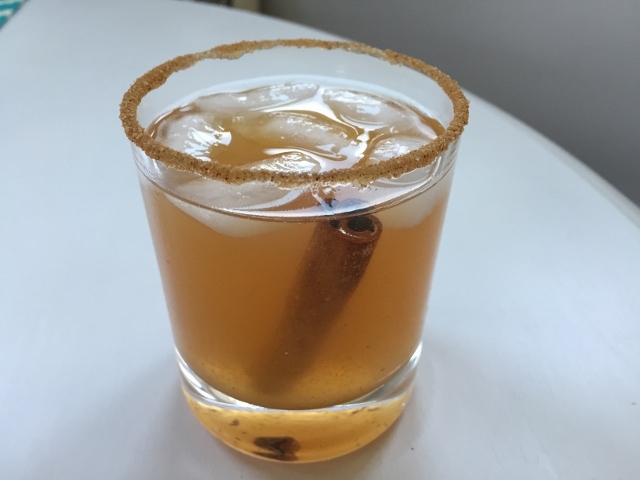 One of the things I put on my fall bucket list is to perfect an autumnal drink. Something that had apples, and fall spices, and just felt like a cooler weather drink from the first sip. Dan beat me to the punch on this one and created what we’ve named So Long Summer Cider. Start by pouring the honey onto a flat dish and doing the same thing in another dish with the cinnamon sugar. Dip the glass in the syrup, then quickly dip the glass in the sugar. To make the drink, combine the cider, whiskey, and a splash of bitters. Add an ice cube (preferably a cool square one) and the cinnamon stick to the glass, and enjoy! We didn’t have any oranges in the house, but you could up your drink game by throwing in a curled orange peel the next time you have guests over that you want to impress. Given how tasty this was, and how non-alcoholic it tasted, it’s sure to become our go-to drink this fall season.